Dan Burkholder is a pioneering photographer and educator who has embraced digital photograph while still keeping his feet firmly grounded in traditional photographic processes. Throughout his career, from creating methods of creating digital negatives for contact printing to his newest experimentation with smartphone artistry using an iPhone, Dan has continued to innovate and inspire. His iPhone artistry combines the iPhone and traditional platinum/palladium printing and fine-art metal leafing methods. Dan Burkholder made the first platinum/palladium over gold leaf prints in 2008. 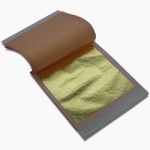 The hand-coated platinum/palladium sensitizer is brushed onto a thin vellum paper treated for maximum translucency. The 24K gold leaf is applied to the back side of the print. The color of the image highlights is the gold itself shining through the membrane-like vellum. 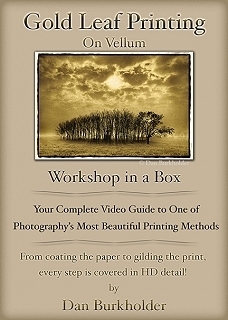 Dan has created an instructional video of his popular workshop, Gold Leaf over Platinum. Freestyle is proud to support Dan in educating artists in this technique and hope that you will find inspiration in working with these various materials.